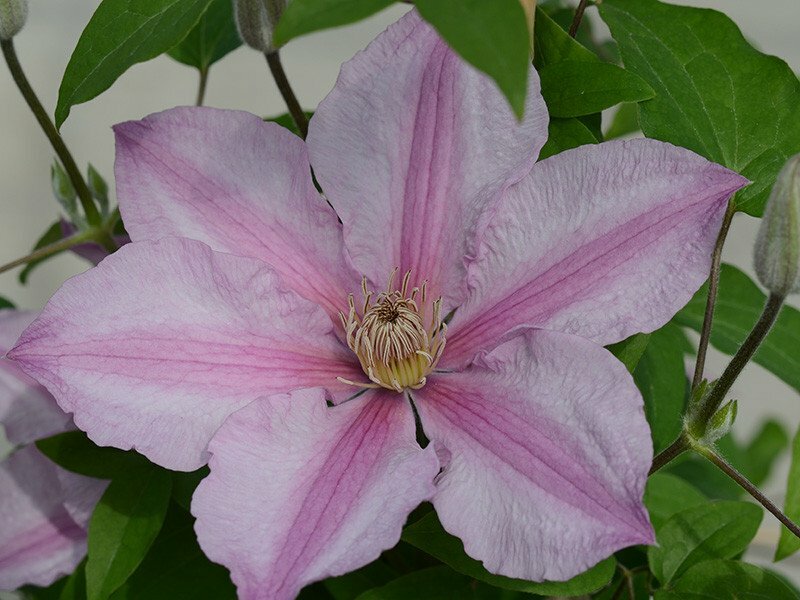 This multi flowering clematis has six to seven pointed deep pink sepals, each with a deeper pink central bar, and contrasting light brown anthers. The distinct deep pink always seems to glow making it a very attractive flower. The mass of flowers appear from late Spring until late Autumn and are produced in great abundance. It is a very good repeat flowering plant. An ideal plant for growing with a great range of host plants either as free standing shrubs or as wall trained shrubs. Also looks amazing with golden or white variegated shrubs and outstanding with grey foliaged shrubs or perennials. A great plant to grow with climbing roses on an archway, where it will grow up to 5ft (1-5m) mixing well with other pinks, yellow or cream coloured roses. Flowering Period: Late Spring to late Autumn. Location: Free standing shrubs, climbing roses, wall trained shrubs, mixed border and on tripods.